With clearing skies and a building breeze, the final day of the Loro Piana Caribbean Superyacht Regatta – Embraer Race Day – was shaping up to be a monster. The overnight standings in both classes meant that several of the superyachts were in with a chance of overall victory, and with the close finishes of the previous race days anticipation was high of a dramatic conclusion. The race committee sent the fleet anticlockwise around Virgin Gorda, with a downwind start, and it was Bolero – at 22.4 metres, the smallest yacht in the fleet – who got the racing underway closely followed by one of the largest, the 53 metre Perini Parsifal III. Nearing the eastern corner of Virgin Gorda, the Class A fleet had compressed and the yachts were trading tacks. Ganesha and Inoui rounded the point line abreast. For Class B, the last leg was a straight downwind run past Necker, and it was Seahawk who hit the line first, scoring her second bullet of the regatta just over a minute ahead of Wisp, who had in turn scored her first win over Marie. The Class A fleet had a final leeward mark to round before a short beat to the finish, and as the yachts closed in on the line P2, the Southern Wind Cape Arrow – helmed by Pier-Luigi Loro Piana – and Freya were side by side. P2 had pulled just enough out to take the gun just 34 seconds ahead of Cape Arrow, who scored a creditable second place just five seconds ahead of Freya. 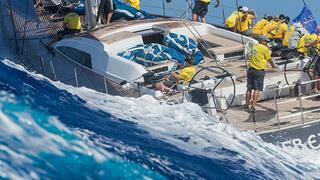 For a full report on Embraer Race Day’s racing, and to see galleries and videos from the event, head to the Loro Piana Caribbean Superyacht Regatta website. Boat International Media and Yacht Club Costa Smeralda, Virgin Gorda, would thanks our sponsors for helping to make the Loro Piana Caribbean Superyacht Regatta and Rendezvous 2015 a great success. Special thanks go to title Sponsor Loro Piana, Gold Sponsors: Embraer Executive Jets and Oil Nut Bay and Event Associates: BVI Tourism and Willis. The event returns to the YCCS Marina in Virgin Gorda from 9 to 12 March 2016, and dates have already been announced for the the 2017 edition, which will run 8-11 March.